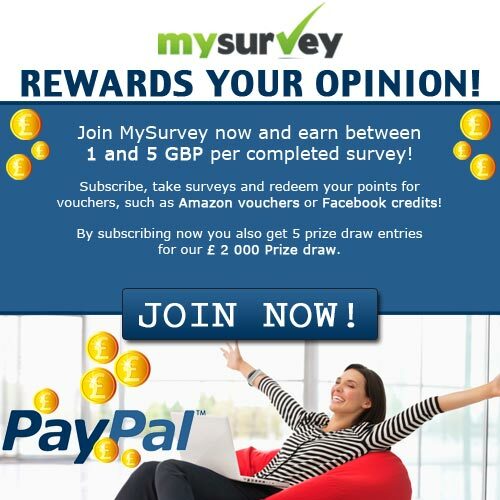 Do you wanna earn Real Cash for taking surveys and receive your money through PayPal? MySurvey gives you trusted solutions. MySurvey is the opinion community brand of Lightspeed Research Ltd – one of the world’s largest communications services groups in the world since 1946. Lightspeed is ranked as the world’s largest provider of custom research and analysis, operating globally across 70 countries. employing over 131,000 people and part of the Kantar Group alongside its sister companies TNS, Millward Brown, Research International and Added Value. Earn points for participating in online surveys and inviting friends. Redeem points for PayPal, gift vouchers and charity donations. Complete mini-polls and get an entry into the £2,000 quarterly prize draw. An unequalled reputation – Owned by Lightspeed Research Ltd.(BBB) that you can trust. Countries: UK Residents(Scotland, Wales and England etc.) only.